Earlier this week, Philippa Ballantine and Tee Morris helped us celebrate Steampunk Week with some spectacular fashion. 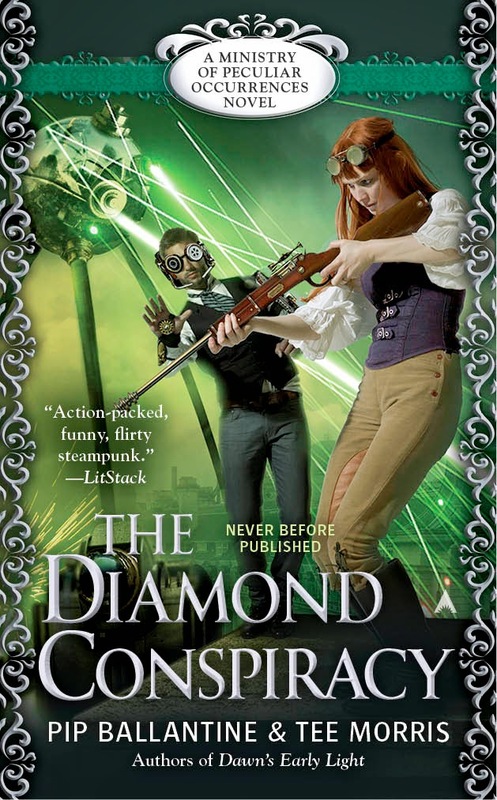 They are currently on a blog tour in anticipation of the release of their latest Ministry of Peculiar Occurrences adventure, THE DIAMOND CONSPIRACY. Today, Philippa joins us to answer some questions about writing as an author team, what's up next for both authors, and where steampunk might be going. KF: People talk about "hybrid authors" - authors who are both self & traditionally published. You've taken this to another level with your books, short stories, podcasts, book trailers (that are magnificent little movies). What else do you have planned? How do you keep all of the balls in the air, juggle all of the different media? PB: Both Tee Morris and I are working on our own separate projects. We have novels in urban fantasy, epic fantasy and historical fantasy in the works. As far as the Ministry goes, we are working on book five, and we plan six books in all to tell Wellington and Eliza's stories. After that we are thinking about other novels set in the Ministry world, maybe for Sophia del Morte, and the team of Bruce and Brandon Hill. Those are just ideas pinging around our heads right now. We are about to launch Season Four of the podcast anthology Tales from the Archives, and we're really excited about this seasons stories. Tee has been working hard on editing the Diamond Conspiracy book trailer, and that should be live right now! We have learned through trial and tribulation how best to co-ordinate our traditional publishing requirements and our independent works. We've painted one whole wall in our office to make it a whiteboard, and we keep our whole year goals and plans there. It really makes a big difference to have it all laid out like that, and to help stop any arguments. Plus, wiping things off the board is very satisfying. We share an online calendar, as well as writing things on our whiteboard. I confess sometimes we try and cram too much into a year, but we're trying to keep everything ticking along, while not saying no too often. KF: I grew up on Wild Wild West and the Avengers, and this series has always has a nostalgic tug for me back to those roots. What were some of your influences? PB: Tee has massive love for the Wild Wild West (the TV show) and the Avengers. The funny thing is I hadn't seen either! I guess New Zealand wasn't quite as up to date- though once he showed me them I really enjoyed the series. I know that 20,000 Leagues Under the Sea is one of Tee's other big influences. I understand they have a theme park in Japan with a full scale Nautilus, and I know he'd run off there given half the chance. My personal influences are historical. I am mad for the Victorian time period, since it was such a time of change in both industry and society. It also gives me a good reason to spend a lot of time staring at old photographs, which as a former librarian I did quite a bit of. KF: As an author duo, how do you work together on the books? You're also accomplished solo authors. How does it compare? PB: There is a real joy in working with another person. Tee and I after four books have got over most of the hurdles that we had when we first started off. Back then, I would write Eliza, Tee would write Wellington, and we would take turns writing the interludes. Then we would turn around and edit each others work. After awhile however, we ended up writing scenes more organically, and not so restricted to male/female roles. I guess that came with a certain level of comfort, trust and knowledge of each other and the books. There are many great thing about working with another person. If you get stuck, you have a person to turn to. Writing dialogue is a breeze if you essentially just act it out and write it down. However best of all I have found is the brainstorming sessions. There is a great whizz-bang of ideas bouncing between you and your co-writer. The only down-side is really if you disagree with something they want to do. We've only had a handful of situations like that in the course of four books, and the person that wins is the one that comes up with the best justification for what they want. Tee and I are probably running about half and half as far as winning goes! Writing solo projects you miss all that, but there is a certain freedom of being totally in control of a project yourself. Personally, I want to keep doing both to get the best of each. KF: What drew you to steampunk? PB: There are so many wonderful things about steampunk. I had already written a historical fantasy, where I combined fae and Shakespeare, so it was an easy for me to take that experience to Victorian England. When Tee and I began talking about collaborating back in 2008, he introduced me to steampunk, and I was quickly hooked. It has a specific look which actually lends itself to story telling. It has airships, adventure, daring men and women, and for me it was just fun. Steampunk is such a flexible genre that you can do horror, fantasy, sci fi, or even travel to other planets. Yet it is that unfettered adventurous spirit that really got me, and continues to excite my creatively. KF: Where do you see steampunk headed? PB: I think that steampunk has to have some kind of television or movie breakthrough. We've heard rumblings about all sorts of projects trying to get funding for the last few years. I suspect, the only thing holding it back at this stage really is how pricey it would be to do well. It combines the costs of putting on a period drama with the costs of doing a science fiction special effects production. However, I do think that there will be something that finally gets funding and takes steampunk to the next level. As far as writing goes, steampunk is firmly part of genre fiction now, and I don't see that changing anytime soon, especially since it fits in with so many other genre writing. KF: What projects do you have coming up? PB: Next out of the gate is a non-fiction title, that Tee and I co-wrote called Social Media for Writers. Tee has experience as a teacher and a social media professional, and we've both been in the field for ten years or so. It should be coming out in the Fall with Writers Digest. We also have a couple of independent novels, brand new series that we are excited to release in the next year or two, but we aren't quite ready to announce the details on those...so stay tuned! KF: Thank you so much for joining us today and being part of our Steampunk Week! Note: All right, there's nothing peculiar about this interview, but given the name of the author's series, I couldn't help it! THE DIAMOND CONSPIRACY is out March 31. Signed copies available through the author's Square marketplace. This blog is always sharing useful facts. The post is really amazing. It has many helpful information which is written in a simple and meaningful way. thank you for sharing this article. The content is honestly written. Keep sharing more posts.